To put their geology skills to the test, students set out to make a geological map of area 1, which is near our home in Ileret. This map not only included essential features such as a key, a compass showing where north is, and a scale, but also important geological features including tuffs, ancient river banks and faults. 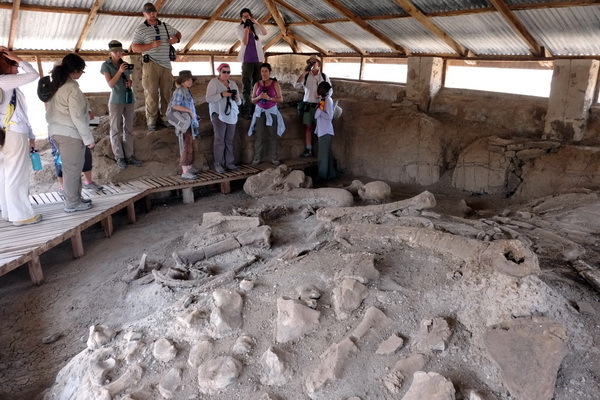 Students set out to map Ileret! Photo credit Deming Yang. 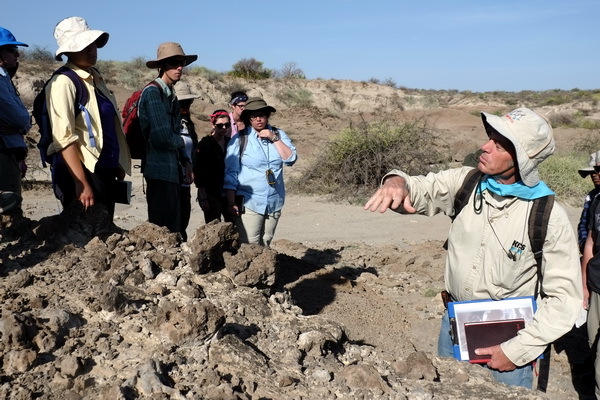 Professor Feibel points out important geological features to a group of students. Photo credit Deming Yang. 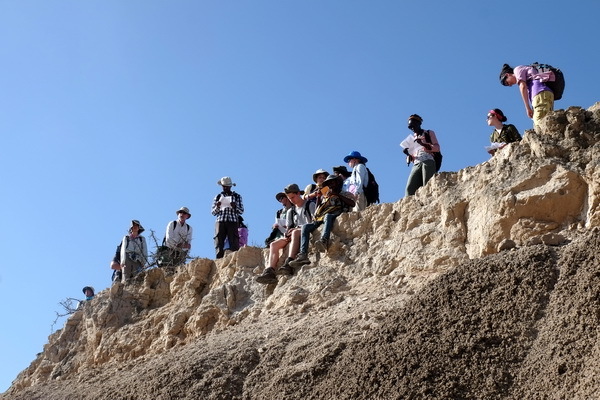 Students take a break on top of a tuff! 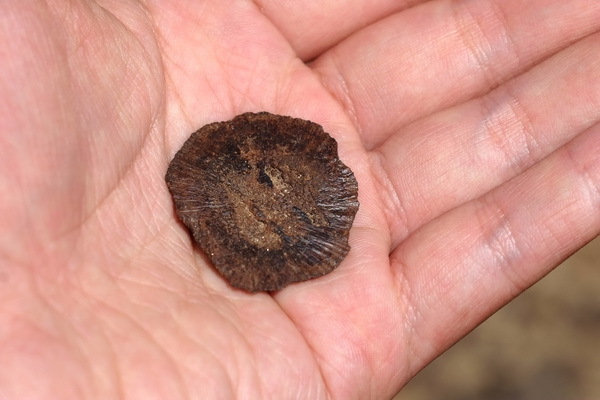 Tuffs are made up of volcanic sediment and can be used to date important archaeological sites! Photo credit Deming Yang. 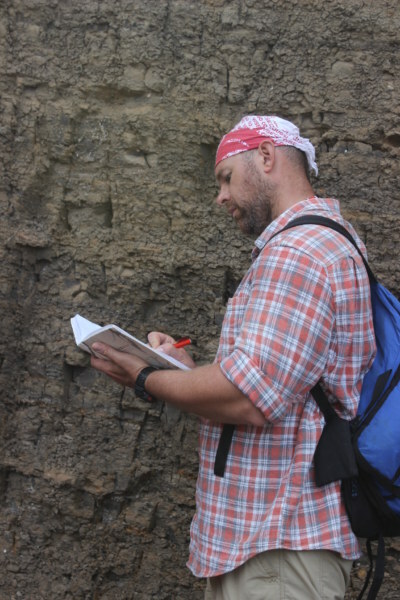 Dr. Raynolds discusses a fault found in area 1. Photo credit Deming Yang. 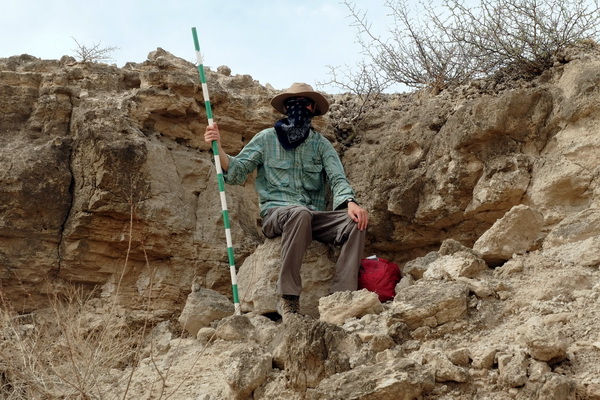 Here is Andrew, King of the outcrop. Photo credit Deming Yang. 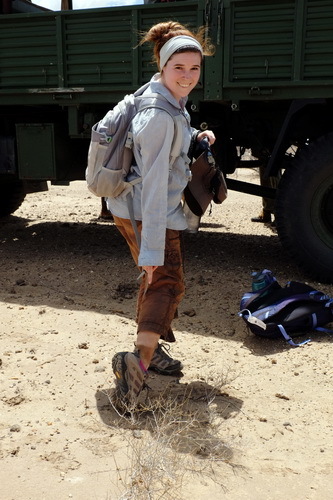 After exploring Ileret, students were ready to load up into the lorry and travel to Koobi Fora for a camping trip. 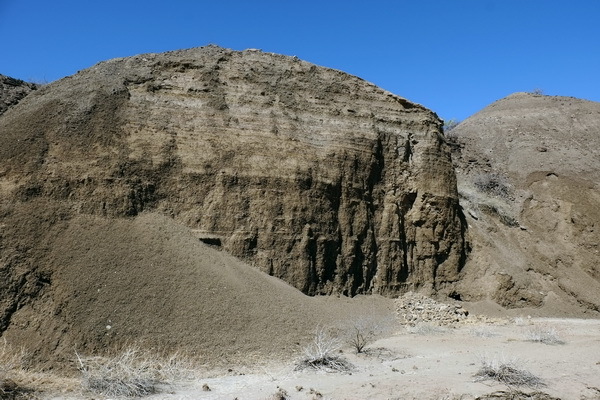 Koobi Fora is known for its large preservation of hominid fossils as well as its remarkable geological features. Students excited for their first TBI camping trip! 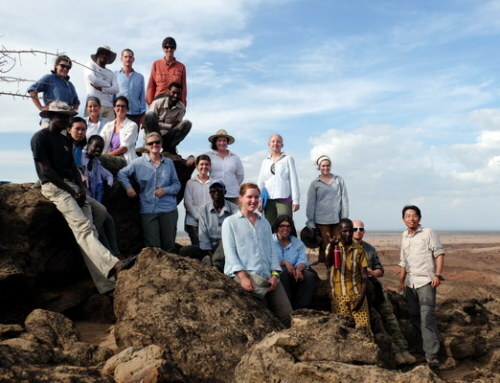 On our way to Koobi Fora, we stopped at an ancient elephant site that was excavated in 1974. The skeleton was so large that instead of bringing it to a museum, the researchers built a museum around it! The house in which the ancient elephant resides. Photo credit Deming Yang. Students view the 2 million year old elephant! Photo credit Deming Yang. 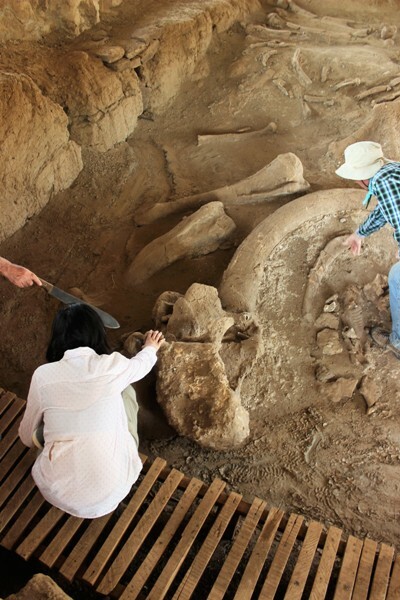 Yishan examining the back of the ancient elephant’s skull! Photo credit Hilary Duke. 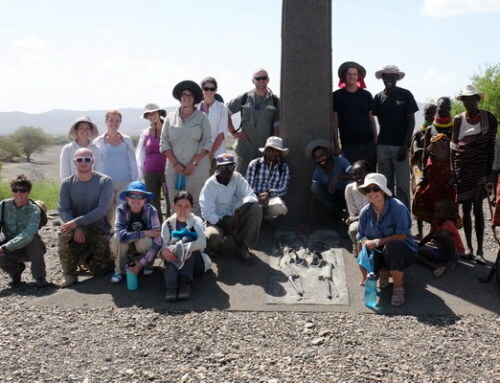 We also stopped at the old Koobi Fora base camp. 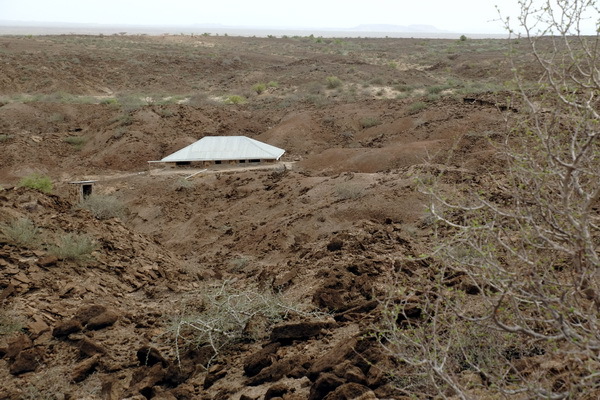 While not in much use anymore, this camp was established in 1968 by Richard Leakey and has been the place of great paleoanthropology research throughout the decades. 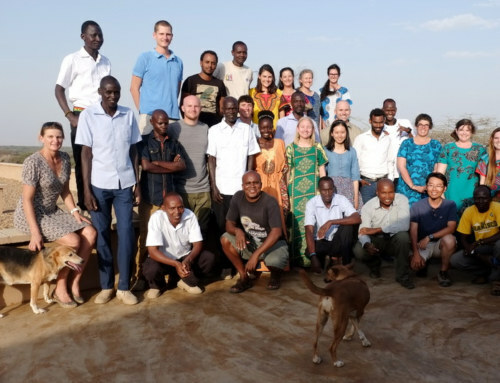 Lucky for us, the base camp is located on Lake Turkana’s shore and the students were able to enjoy a swim after the long lorry ride. 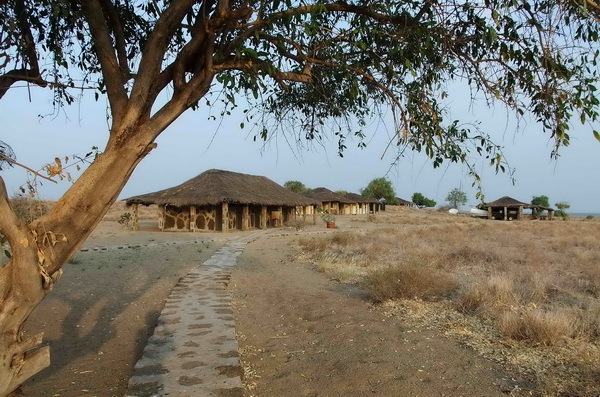 The old Koobi Fora camp. Photo credit Deming Yang. Finally, after a long days journey, we reached our fly camp. Here we were able to rest and refuel as we prepared for the field adventures to come. 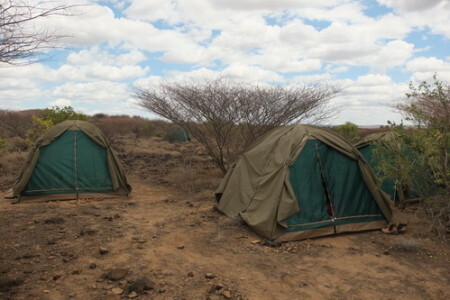 Tents at our fly camp. Thank you to the wonderful TBI staff for setting the tents up for us! Photo credit Deming Yang. 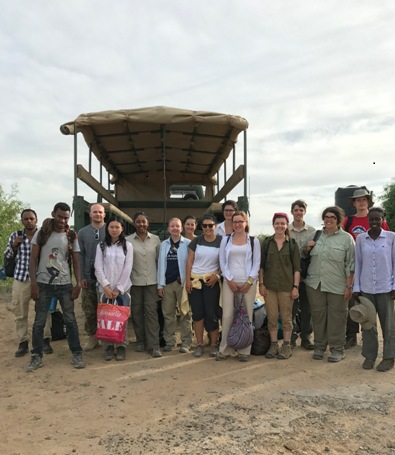 After a good nights rest, Professor Feibel and Dr. Raynolds took the students on a once in a lifetime experience through the outcrops of Koobi Fora. 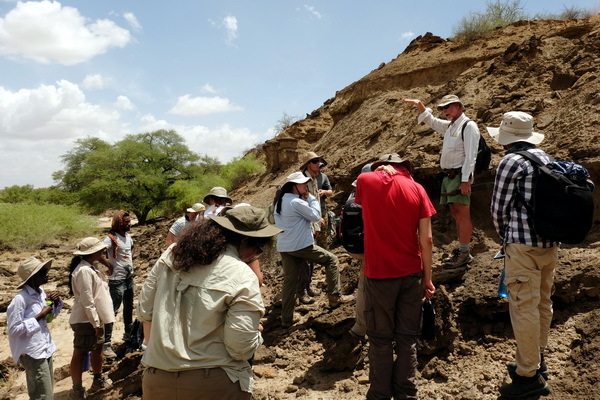 This area is unlike anywhere else in the world and is ideal for students eager to learn geological features. 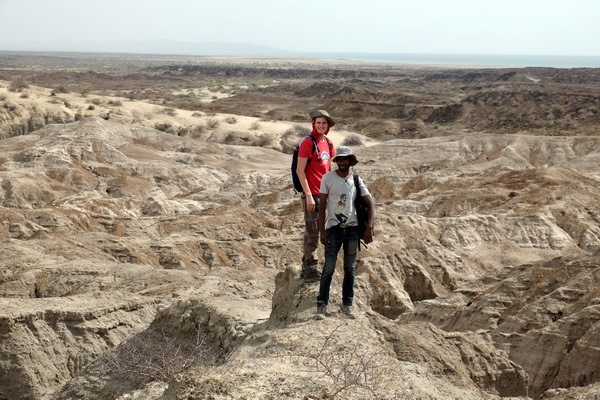 The landscape of Koobi Fora has been shaped by unique volcanic, tectonic, and sedimentation processes that have preserved the dynamic lake river system of Lake Turkana. This preservation is observable in beautifully exposed outcrops spanning the modern landscape. 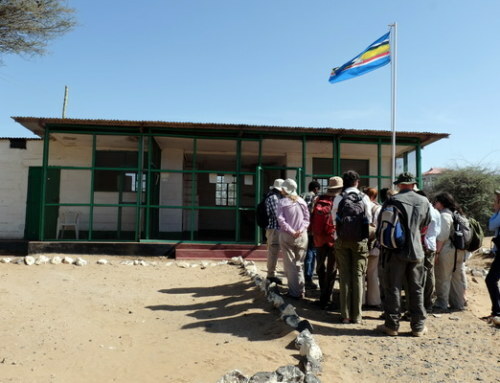 Thus, Koobi Fora provides the perfect place for students to put their skills of reconstructing paleoenvironments, knowledge of rocks and minerals, and use of geological tools such as the Brunton compass, Jacob’s staff and GPS, all together to gain full understanding of the geology in this area. 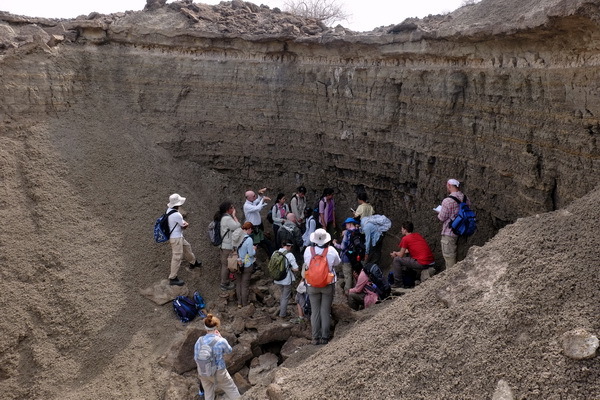 Professor Feibel showing the students an outcrop that contains fossil traces of mollusc burrows throughout it. Photo credit Deming Yang. 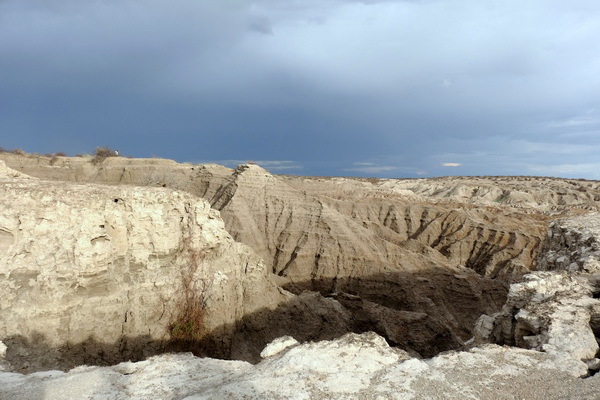 Amazing exposure of sediment that had be deposited in horizontal laminations when it used to be part of a lake bottom! Photo credit Deming Yang. A piece of mineral from an eroding layer of outcrop that is quite rich in Magnesium. Photo credit Deming Yang. Can you reconstruct the paleoenvironment of this beautiful outcrop? Our students can! Photo credit Deming Yang. Goitom and Charlie enjoying the stunning view of Koobi Fora. Photo credit Deming Yang. Tom takes down notes in the field. Photo credit Hilary Duke. 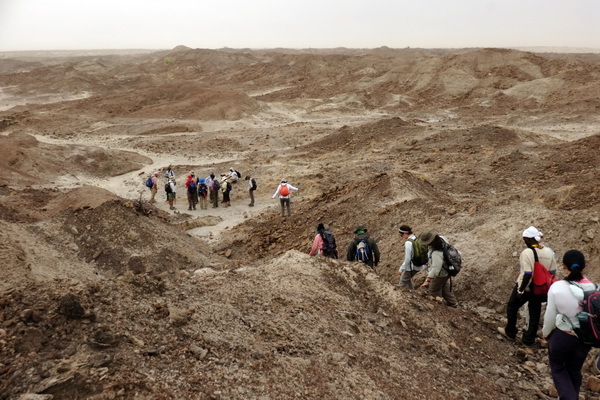 Students were given a treat when they were taken to the site where KNM-ER 1808, an ancient hominid specimen, was found. 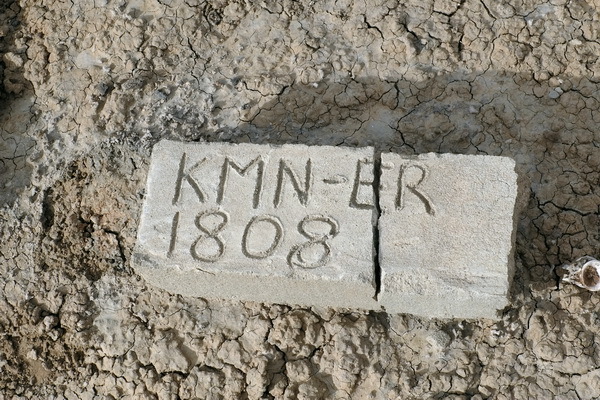 A brick inscribed KMN-ER 1808 marks where KNM-ER 1808 was found… Photo credit Deming Yang. KNM-ER 1808 is a 1.7 million year old partial skeleton from a homo erectus. 1808’s femur (thigh bone) has an interesting overgrowth of bone, indicative of bleeding just before, and likely the cause of, death. Scientists believe that this may have been due to an excess of vitamin A. One way an ancient hominid could have received too much vitamin A is from eating carnivore livers! It is truly spectacular how we can learn so much about the past from what we currently observe. Students head back to the lorry after a fulfilling day in the field. Photo credit Deming Yang. TA Laura showing off her dirt “tan” line after a day in the field. Photo credit Deming Yang. 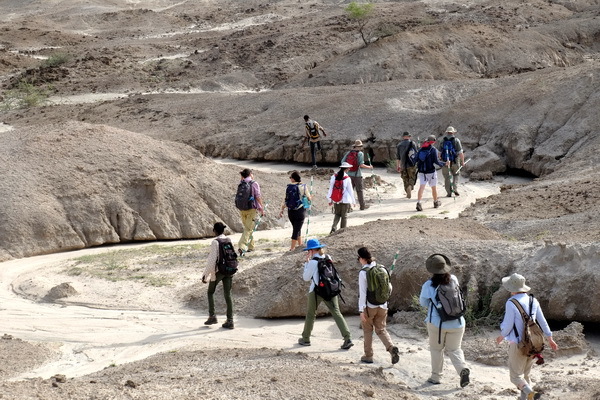 Koobi Fora provided an excellent opportunity for students to practice the skills they have learned during their module and to witness geological formations unlike anywhere else in the world. 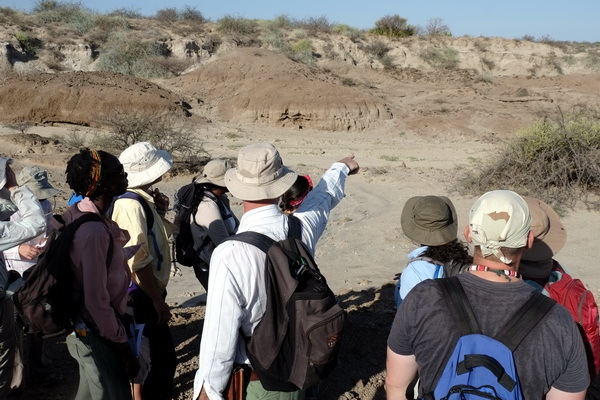 While the geology course has ended, the students will carry fundamental knowledge of the geological context behind all other anthropological research in the Turkana Basin with them as the continue through the field school. Storms coming in over the outcrops of Koobi Fora. Photo credit Deming Yang.